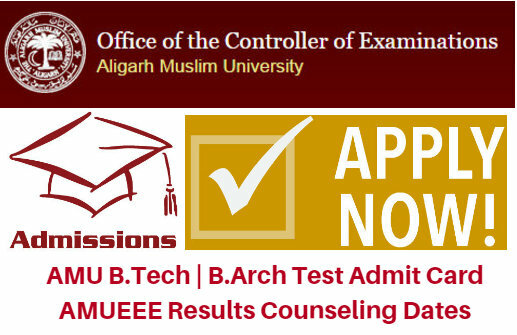 The Aligarh Muslim University (AMU) is likely to conduct the Aligarh Muslim University Engineering Entrance Examination-2018 (AMUEEE-2018) to admission in undergraduate degrees courses like Bachelor of Technology (B.Tech) and Bachelor of Architecture (B.Arch). The AMU B.Tech / B.Arch Entrance Exam AMUEEE 2018 will be held soon at the various centers across India. The Candidates, who want to take admissions in the AMU University, they can apply for the AMU B.Tech-B.Arch Online Form through official portal. The Controller of Examinations, AMU shall upload the e-Admit Cards / Hall Tickets for AMUEEE Entrance Test 2018. The Aligarh Muslim University shall issue the e-Hall Tickets 07 Days before the AMUEEE Entrance Test is scheduled to be conducted. The Candidates can download AMU B.Tech / B.Arch Entrance Admit Cards through official website of AMU. The Controller of Examination, Aligarh Muslim University invites applications in prescribed forms for admission in B.Tech / B.Arch programme for the academic year 2018-2019. AMU University is going to organize the entrance test (AMUEEE-2018) on 29th of April 2018 for all the candidates before they complete the admission process in the AMU University. Zakir Hussain College of Engineering & Technology is affiliated by AMU University. The AMU B.Tech / B.Arch Admission will be confirmed based on the eligibility norms as well as the marks scored by candidates in the AMUEEE-2018 Entrance test. AMU B.Tech/B.Arch Selection Process: Through Admission Test. Admission shall be offered through Counselling. There shall be one objective type paper of 150 marks comprising 150 questions on Chemistry, Physics and Mathematics. Time Duration is 3 Hours. For applying using online mode of application, students need to reach the official web of the University. Candidates need to fill the application forms and need to attach the required documents along with the applications and need to send this application before the last date of applications. Visit the official website www.amucontrollerexams.com. Click on the “B.Tech / B.Arch Admissions 2018-19”. Select the “Apply Online” process. Read the provided details carefully. Fill the required details like as your personal information and about your education details. Then click on the submit button and submit your form. Take a print out the hard copy. The Department of AMU will declare the AMUEEE Entrance Test Result on the official web portal. AMU B.Tech / B.Arch Admission Test Results will be declared within one month from the Entrance Test. The shortlisted candidates are called for the counseling for the seat allotment. The candidates who are shortlisted for counseling will be intimated through the notice boards of the concerned faculty. Seat into to the particular course or branch will be followed by counseling. The distribution of seats and courses shall be offered through counseling. On the counseling date, the candidate must be present 30 minutes before commencement of counseling with print out of Online Application Form along with all the original testimonials for verification by the authority. Exam Name: AMUEEE Admission Test.